Air Plants: they toxic? And, what's toxic to air plants? You’ve probably heard the worn-out excuse: my dog ate my homework. But, about: my cat are my air plant? Find out of air plants are toxic. 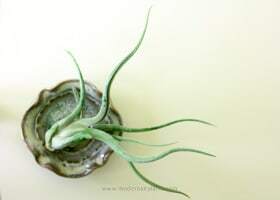 While we’re talking about toxins, as an air plants grower, you should be aware of a few things that will compromise the health of your tillandsia. Although these toxins are commonly found, thankfully, they are avoidable. First off, thankfully, no, air plants are not toxic to humans or pets. So if your cat, or dog, or child, eats your air plant it will be no worse for wear. 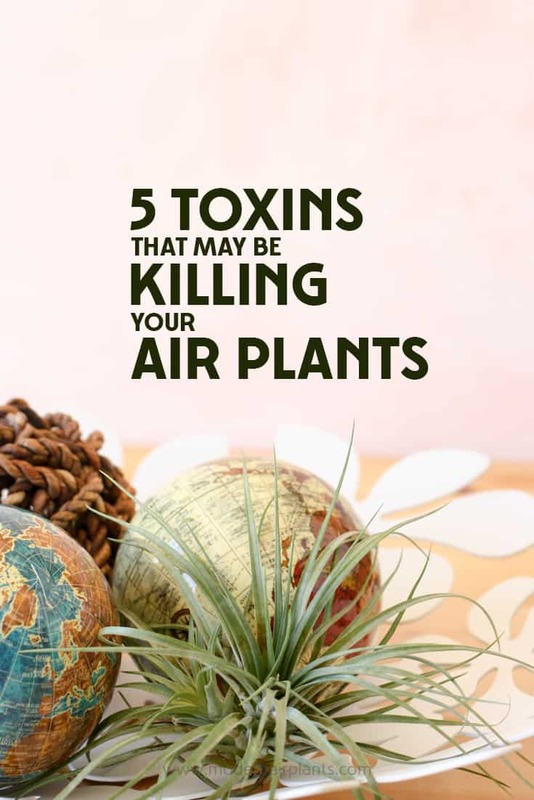 It is far more likely that that toxins may be introduced to your air plant. Here’s what the toxins are and how to avoid them. 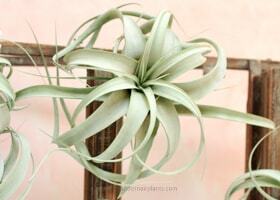 As harmless and pretty as copper appears, it is toxic to air plants and should be avoided. Don’t use copper wire, copper plant holders or pressure treated lumber, as the chemicals to treat the wood contains copper. Too bad, so sad! 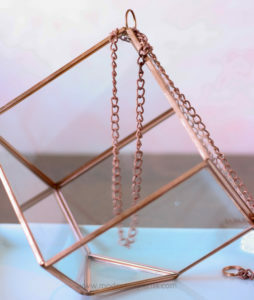 This copper terrarium won’t be housing any air plants. Before using a particular fertilizer read the Guaranteed Analysis to see if boron, zinc or urea-nitrogen are included, as these elements are harmful to air plants. 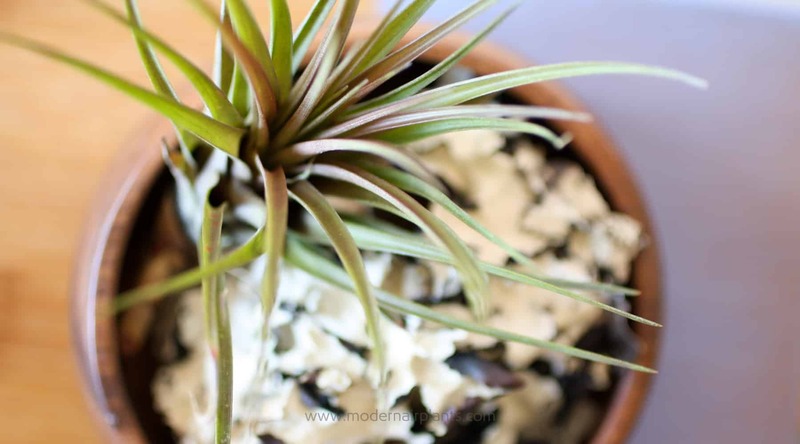 While you want a fertilizer without boron, zinc or copper, air plants do need nitrogen. They just need it in a usable form. Look for a non-urea nitrogen fertilizer. Fertilizers containing urea depend on bacteria in soil to convert the nitrogen into a usable form for the plants. As air plants are not rooted in soil they cannot absorb nitrogen in this form. Instead the air plant will be harmed instead of helped. Tip: To be on the safe side, use a fertilizer specifically formulated for tillandsias or bromeliads. 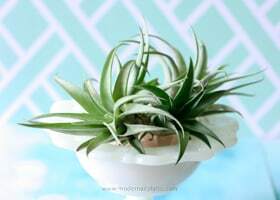 To learn more about fertilizing air plants, check out the post below. When creating displays be advised that rust is toxic to tillandsia. 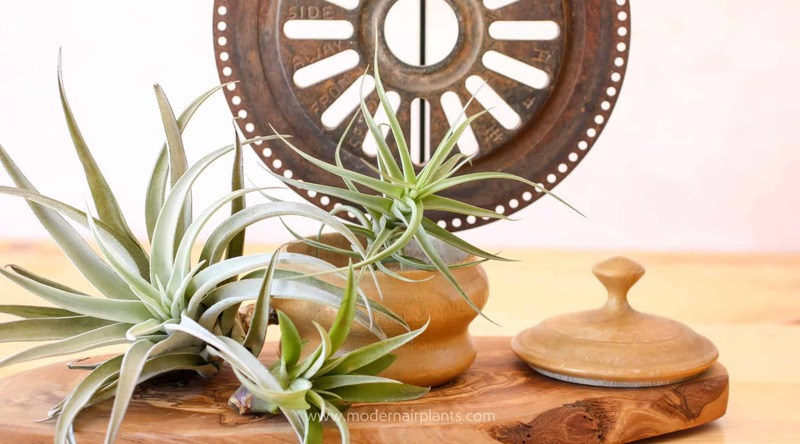 If using rusted metals, such as the industrial-style object in the background of this photo, make sure the air plants and the rust are far enough away that they don’t touch. I have Read over your recommendations, however, I make Wall decor using different item that will hold my airplants. I have Intentionally given my galvanized little buckets a rustic look, by making them rusted. All my air plants have been doing very well. Is is possible that it’s a fluke they haven’t died or that they will eventually die? Interesting, thanks for sharing. How long have you been caring your air plants in this way – in rusted containers? I would love to know how they fare. Air plants usually die very slowly – cold damage is an exception. (They show signs of cold damage very quickly.) I’d love for you to keep me in the loop. What about wood, driftwood, forest deadwood etc. Would these be toxic to airplants? Driftwood and forest deadwood should be fine as long as you don’t use walnut as it contains chemicals that inhibit the growth of other plants. Avoid decomposing/rotting wood. Also, if you can place the air plants on the wood without gluing them to the wood, your air plants will live much longer. I noticed that most available plant hanger in the market is galvanized wire and I’ve been using galvanized wire to hang my plants. Is this a bad idea? Thank you for your question. Galvanized wire is a good choice for air plants as it prevents the wire from rusting – and rust is toxic to air plants. So, keep using your galvanized wire. First, thank you for all the great advice and tips. I recently moved to Florida and discovered air plants…now I’m addicted. I’ve ordered several buds for my home after being told the beautiful ones i originally purchased would never flower again…something the florist assumed I knew. Now I’m trying to find out how long it takes for a bud to grow to maturity and bloom, and then how long before it will produce buds of it’s own. It is hard to give these things a timeline – some buds grow more quickly than others. The flowers on air plants can be spectacular – or kind of meh – depending on the type of air plant. I especially like the flowers from these air plants: T. aeranthos, T.melanocrator v. concolor, T. stricta, T. fasciculata and T. caput-medusae. As captivating as the flowers can be, enjoying the air plants as much as the flowers can bring a lot of satisfaction. Fertilizer – can help produce colorful blooms, but use judiciously to prevent burning your air plants. Sunlight – it takes a lot of energy to produce flowers. Also, an unhealthy air plant can produce flowers at a last attempt for self-preservation. Thanks for interesting info very interesting. My air plants grow outside on a metal plant holder which does not get a lot of sun but light. Problem does not flower? Thanks for post! I just had plants wither in silver (or silver plate ) bowl and also a brass scale. The silver was worse than the brass. Good to know! Thanks so much for sharing! Do you have others on a porcelain or something similar to compare the air plants reaction? I’m very new to air plants and have learned a lot from this site. I was told to use glue to attach them to their container. Is regular hot glue ok to use? Is aluminum ok to use as containers? Thank you in advance! You can use hot glue or you can also use floral adhesive. Yes, I do believe that aluminum should be okay for your air plants. It sounds like you’re creating something wonderful! Yes. Rain water is fine and can be reused over and over. Just for the record, your tap water is probably just fine. I have used tap water, rain water, and pond water and mine are all thriving. I have A LOT of air plants, so in the summer I fill a kiddie pool outside and let the water warm up for a day, and then soak my air plants the next day. In the winter months I fill my bathtub with tepid water and soak them in there. Thank your for your thoughtful question. Hi, I’m planning on using this a spice rack made of chrome plated heavy gauge stainless steel wire to house my large collection of air plants. 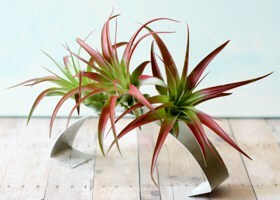 Will stainless steel and chrome be be fine for the air plant? Just want to make sure they aren’t toxic to them. Some really great information! My friend wants me to make her one of those wire air plant holders that is attached to a quartz stone (l do wire-working). My question is: Is aluminium toxic to the plants? I have aluminum wire and silver-plated copper wire. I would feel better using the aluminum if it’s safe. What about using fish tank water? I had heard it was a good option to use the water from cleaning a fish tank, but I have no idea what’s in it with regard to nitrogen and urea and whatnot. I think it would depend on how often you change the water. If you keep your tanks pretty clean the salts would be lower. Also, you could dilute the fish tank water with tap water. I would check the pH before I tried it. Air plants prefer a pH between 5.5 and 6.0. Keep in mind that air plants take a long time to show signs of stress. So, if you do try the experiment, use the same air plants with the fish water. Another thing to consider is that because air plants are epiphitic they are unable to convert urea-based nitrogen fertilizer into a usable form. If you try the experiment, let me know how it goes. Buon giorno sono Claudio chiedo un suggerimento 2 anni fa ho comperato una delle vostre bellissime piante,dopo 2 mesi ha fatto un bellissimo fiore blu, dopo ltre mesi ha messo tre figli,chiedo come posso separarli dalla pianta madre senza romperla ? ringrazio della risposta e saluto cordialmente Claudio. Congratulations on your air plant babies! To separate the plantlets from the mother plant, grasp the two plants by the base and pull them apart with your fingers. after watering. Should I wait until the plant is completely dry before apply the fertilizer? I use a spray fertilizer specially formulated for airplants. Good question. After watering, you can fertilize your air plants while they are still wet. I think copper is pretty and I see copper air plant containers all over the internet, but I do recommend keeping your air plants away from it. Or, put it to the test and let us know your findings. Keep in mind that it is a slow decline. I was going to put my new arrivals in my copper stainer…..glad I got this tip today! Thanks so much, you just saved the plants I dont even have yet! You could always try a nice thick layer or two of clear coat spray paint… I really like Rust-Oleums Triple-thick Glaze. It seems to be safe enough for my tillandsias, especially if the copper pieces aren’t outside in the elements all the time. Just keep an eye on the metal, making sure it’s covered nicely and applying more coats as it wears off with time. So what if you coat the copper with several layers of a spray polyurethane, really really well? Would that make a barrier so the copper could still be used? Could this be used on iron (that might rust), they make marine poly! 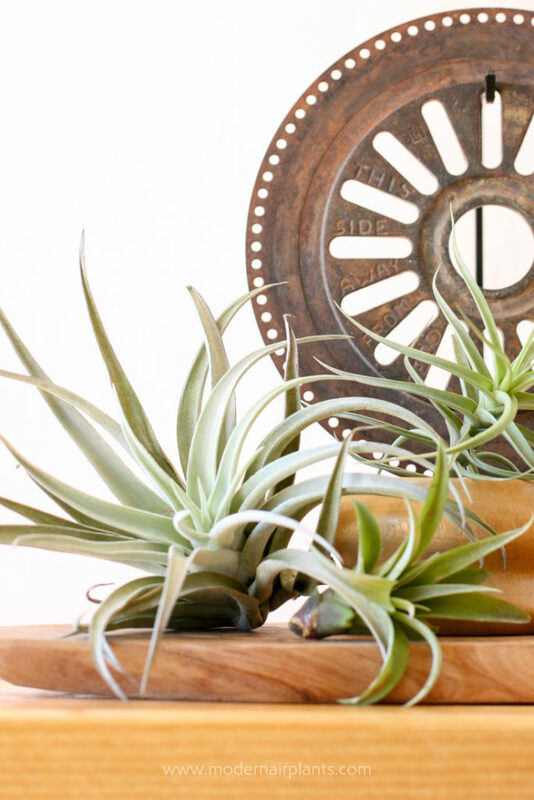 Spraying copper with polyurethane to serve as a protective barrier between air plants and copper (or iron) is definitely worth a try. I am all about experimentation. I am going to revise my previous position. My brother (who studied chemistry) thinks that although both copper and zinc are toxic to air plants, perhaps, when they are combined to produce brass (an alloy of copper and zinc) they are less reactive. So, I would go ahead and try using brass as an air plant holder and see what happens. If you’d rather not experiment, stick with stainless steal. Thank you for this post! I’ve had some air plants that have had a difficult time since I moved them to a copper plant holder. This explains why the tips have been dying. Yes, it’s a slow death, but copper is toxic to air plants.